Final checks are being carried out prior to the sinking of our latest underwater attraction, a Hyperbaric Chamber. A new Scuba Diving attraction was delivered to the National Diving & Activity Centre today. 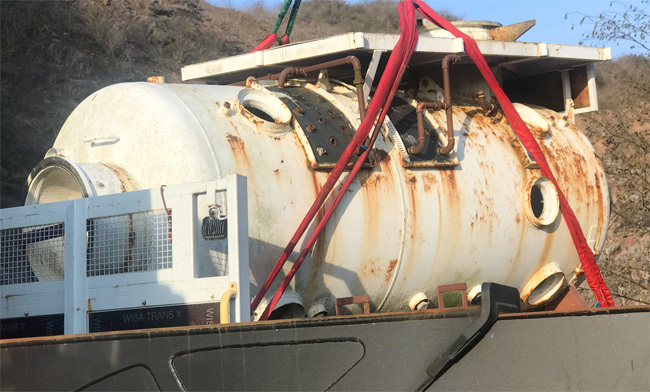 The Hyperbaric Chamber has retired from its previous life at DDRC Healthcare and will be placed at 20-30m as an underwater diving attraction. 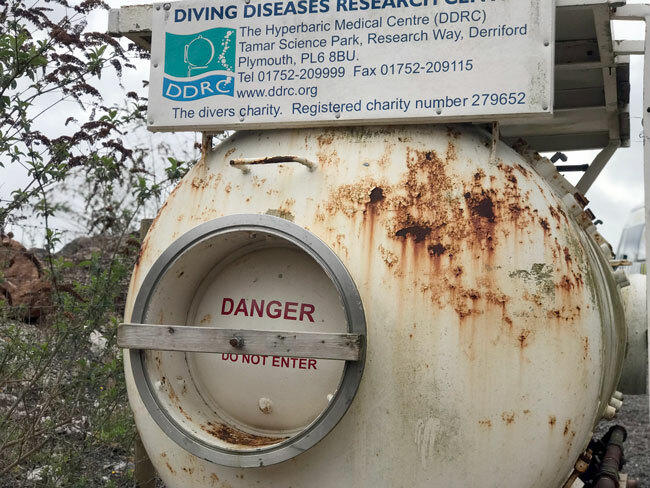 Over 20,000 people saw our AprilFools post last week, but we’ve got some very exciting real news today for divers! Later today we will be installing our latest underwater attraction, ‘Caroline’. This 35 Tonne steel trawler traveled over 500 miles from Aberdeen in 2013 to its final home as an underwater diving attraction at the National Diving & Activity Centre. We have recently been completing the final works to our latest underwater attraction, and this weekend the original prop was welded into place. The new boat, named ‘Caroline’ is 11.33 metres long and the plan is to place her in the water at around 25m, providing a fantastic wreck diving experience. It has been a very busy week at the National Diving & Activity Centre with the installation of four new underwater attractions. We now have a new addition to Land Rover Lagoon, a Double Decker Bus, a Single Deck Bus and a 16 tonne Abbott Self Propelled Gun. All the attractions are ready to dive now, so why not pop down and have a look yourself – with so many new attractions you might want to book a weekend with us in one of our Wooden Wigwams. The first bus is a traditional 56-seater single deck bus that weighs in at 6.5 tonnes and has been used in active service throughout Cardiff over the past 15 years. She has clocked up an impressive 500,000 km so I’m sure some of you may have even travelled on her at some stage! The second vehicle is an impressive Double-deck bus; she seats around 60 to 80 passengers, It is around 10 meters in length, 4.5 meters high and her gross weight is around 12 tonnes. 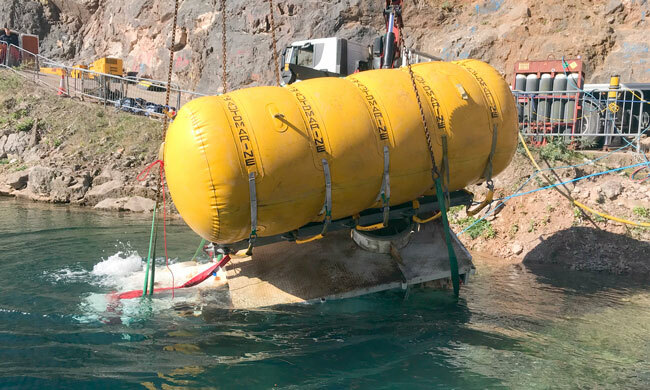 We believe these underwater busses will not only provide a stable, safe and exciting training platform but also to act as a swim through attraction for the more confident divers amongst you. So whilst our students are conducting their skills and drills above you could be swimming through underneath them – You won’t even need a ticket! The Abbot Tank or ‘Self Propelled Gun’ built by Vickers was used by the British Army between 1965 and 1995 and is still in service with the Indian Army. In its day the Abbot FV433 was able to swim across water due to having a flotation screen fixed around the hull, which would be raised to provide buoyancy. The action of the tracks was sufficient to drive it forward at about 3 knots. Each swimming Abbot would of been supported by a fully amphibious Stalwart Mk 2 High Mobility Load Carrier that carried additional ammunition. This Abbot’s floating days are long over and it now is retiring happily at the NDAC quarry, reunited with it’s old friend the Stalwart ‘Stolly’. Both buses are under 20 meters and the Abbot is sitting around 30 metres. The new landrover is situated around 10 metres. None of this would of been possible without the help from the Corps of Royal Engineers and our thanks goes out to them. The Corps of Royal Engineers are unique with all their "Sappers" being multi skilled soldiers, combat engineers and tradesmen working alongside all parts of the Army they play a vital role in the effectiveness of the British Army and the United Kingdom in both peacetime and on Opertations. Back in 2008 Cardiff Bus & NDAC linked up to obtain two new impressive attractions in the form of one single deck and one double deck bus. Since then we have been working to make the buses fit for purpose and looking at the logistics of physically getting them in the water! We are pleased to announce that the new underwater attractions will be installed at the end of the month. The first bus is a traditional 56-seater single deck bus that weighs in at an impressive 6.5 tonnes and has been used in active service throughout Cardiff over the past 15 years. She has clocked up an impressive 500,000 km so I’m sure some of you may have even traveled on her at some stage! The second vehicle is an impressive Double-deck bus; she seats around 60 to 80 passengers, It is around 10 meters in length, 4.5 meters high and her gross weight is around 12 tonnes!